Flashlight Easter Egg Hunt & Carnival in the Park! Your ticket will include entry to the Carnival and Easter Egg Hunts! All Carnival activities are included with your ticket purchase. 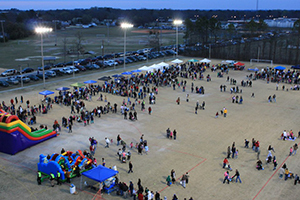 The Carnival portion will consist of carnival rides, inflatables, games, popcorn and more! 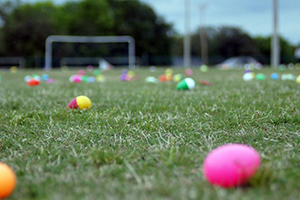 The Easter Egg Hunts will be for ages 0-10 and will have over 100,000 plastic candy-filled eggs and even more treats on the fields! Each child may only hunt one time! Each child hunting must have a responsible adult on the field with them at all times. Everyone must a have a ticket. Please have your ticket ready before you arrive at the ticket booth. You can either have it on your phone for us to scan or you may print it out. Parking attendants will be directing you where to park. Please stay with your children at all times. Each child participating in the hunt must bring a basket or bag to collect eggs. Each child 4-10 needs a flashlight for the hunt. Flashlights for daylight/twilight hunts are optional. Bring cash for food. Popcorn will be free, but the food vendors will be charging a small fee for their items. Adults may go on the fields with their children while they hunt. ADULTS MAY NOT PICK UP EGGS (unless on the Special Needs or 0-1 fields). Information Tents will be located on every field. If you and your child get separated, please go to the information tent. Town of Lexington Police Officers will be on each field manning these tents. Please do not allow your child to pick up candy before the egg hunt starts. Picking up candy before the hunt starts is cheating and no one likes cheaters. Lexington County Recreation & Aging Commission’s government facilities are tobacco, drug, alcohol, and weapon free zones. Smoking/Vaping is not permitted anywhere at the event. Please arrive early for egg hunts. We will open up the fields 10-15 minutes before hunt start times. If you arrive at the egg hunt start times, you will be too late! After the flashlight hunts start, we will wait a few minutes and then turn on the field lights. As a safety measure for all families, the gates on each field will remain closed for approximately 5 minutes after the hunts end to ensure all parties are reunited. Even if your party is all together, you still must wait on the fields until the Town of Lexington Police Department opens the gates. We ask that you open up all plastic eggs, remove candy, and return all plastic eggs to our blue bins located on each field. Please exit the fields the same way you came onto them. All LCRAC Staff will have on orange vests throughout the event. If at any time you have a question or concern, please speak to one of them immediately. All proceeds will benefit the Lexington County Recreation & Aging Commission's Meals on Wheels Program. Palmetto Amusements will be hosting this year's carnival. Event partnership with The Town of Lexington, SC. Tickets are $5 + processing fee. TICKETS are available until 11:59 pm on March 14. LATE TICKETS will be available March 15 & 16 or until the event sells out. Late tickets will available for an increased rate of $7.50 + processing per ticket. Tickets are available for in person purchasing at the Town of Lexington Finance Customer Service window Monday through Friday, 8:00 am - 5:00 pm.